Well that round certainly lived up to the hype. Many many talking points, but it seems fairly obvious to start with Germany vs England. I had a slight inkling that England were going to get a spanking but due to my blind patriotism, I decided to undermine my prediction. As I said, the game would all come down to who was covering Ozil. In this case Gareth Barry took up that role and provided a truly underwhelming performance. He was meant to be the shield for Terry and Upson; that shield was metaphorically made out of crate paper and Germany stook 4 past the woeful defence. I felt sorry for David James as he’s played pretty well but had a pretty poor defence in front of him. I don’t even want to go into the whole Lampard goal as it would have made no difference at all to lacklustre England. I could do a blog about everything that went wrong and how we can look to other national sides in an effort to improve the development of young players. But several respectable journalists have done this to much better effect than I could ever do, so I’d merely be reiterating them. Plus I could ramble all day about what’s wrong with the FA which is boring. On to much less depressing issues. 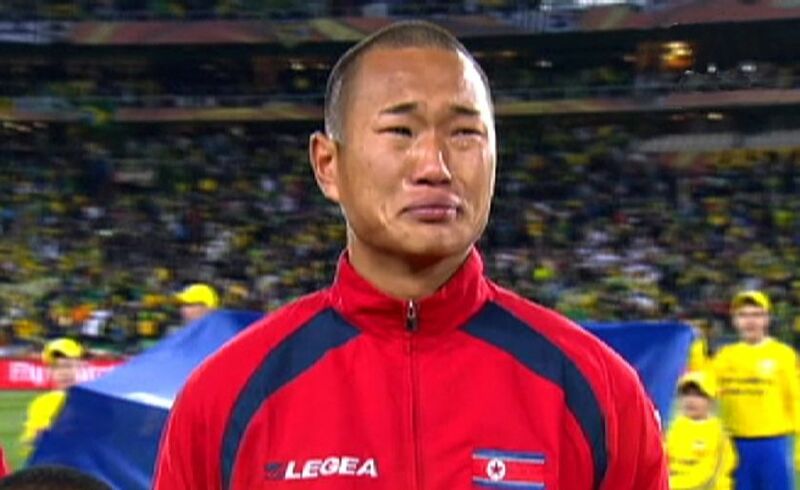 Paraguay and Ghana made the Quarter Finals for the first time. Ghana were brilliant against the U.S. and Kevin Prince Boateng continues to impress me. He’s made the step up to international level look effortless. Paraguay edged past Japan on penalties in quite possibly the dullest game so far, but to their credit, they provided a penalty master-class. The heavyweights of Brazil, Argentina, Spain and Holland all came through their games, some easier than others. Brazil were relatively comfortable against Chile, and Chile can surely be proud of this campaign after bringing some flamboyance and also some hard tackling when pressing. Argentina Mexico was a great game, sealed with a terrific strike by Carlos Tevez. Unfortunately this game will be remembered for the second officiating blunder of the day, when it really should be remembered for being a terrific spectacle. Javier Hernandez scored a great goal as well, and I hope to see more of that at Old Trafford this season. Spain and Portugal was fascinating tactically. Portugal looked the better side until Del Bosque brought on Llorente, who played well unlike Fernando Torres. Portugal capitulated and David Villa sneaked in past a lax Simao. Holland provided an efficient performance against Slovakia. Holland looked a lot better with Arjen Robben, and he scored the first in a 2-1 win. I’ve left Uruguay last for a reason. I genuinely believe they could make the final. The front 3 have been sensational and it’s great to see Diego Forlan finally cast that lazy tabloid tag of being ‘forlorn’. Without doubt one of the best players this year. A reincarnated Total Football vs Dunga’s defensive policy. Maybe they’ll both cancel each other out. Ranking 4th and 1st respectively in the world, this has all the makings of a classic. I don’t think Holland have been tested yet defensively and that will be their undoing if Robinho and Luis Fabiano play well. Both sides can see the semi-final within grasp, a superb achievement for them with neither really expecting to form a run like this. 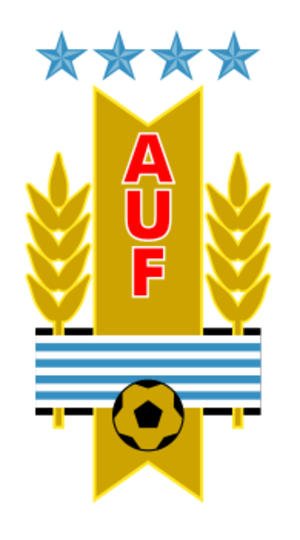 Uruguay front three of Diego Forlan, Luis Suarez and Diego Cavani have been the driving force behind the team, but have been well supported by the defence. 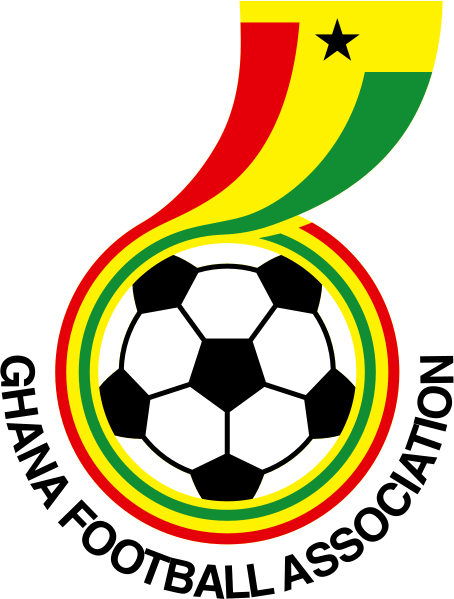 Ghana on the other hand have arguably been led by Asamoah Gyan who’s scored most of their goals, his winner against the U.S. being the highlight. I think the Black Stars don’t have enough at the back to keep Uruguay out, especially with some suspensions. They are also missing Ayew wh0’s been solid. Uruguay are missing key defender Diego Godin, the defensive clearance speciallist in the France game. The second titanic clash of the quarter finals. Diego’s dynamic Argentina versus ‘Yogi Love’s’ youthful Germany. Both sides have been clinical so far and have shown the best attacking football in the competition. The key contest here is Messi vs Ozil. Both have been instrumental in their teams providing the foil to attack and also creating key chances. Both have exceptional off the ball movement. With such great attacking players, both sides look decidedly average at the back. Germany have been flattered by poor opposition, and Manuel Neuer has looked flappable. Also, at times whereas I still worry about Martin Demichelis but if Diego plays Burdisso, it might tighten them up a bit. 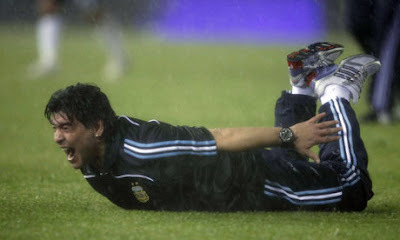 It’s only a matter of time until Messi scores. I see it being here. I’ve been convinced by the extrovert Diego Maradona and I think Argentina will edge a classic although I’m going to sit on the fence, and say a Germany win isn’t out of the realms of possibility if they show the camaraderie and efficiency of the England performance. Paraguay have to be considered underdogs here, but their performances so far have been so inconsistent its impossible to say which Paraguay will turn up. They’ve been good defensively however and you’d have to think that’s what will be needed here. Antolin Alcaraz has been the standout centre-back at this tournament for me, which was a great move from Roberto Martinez at Wigan to sign him pre-tournament. Spain have been underwhelming so far. Their tactics need fine tuning, for example I don’t think they need two defensive midfielder, so Del Bosque needs to drop Sergio Busquets or Xabi Alonso and put in either Pedro, Jesus Navas to add width and ideas. Dropping Torres is also a good move in my book. He’s been terrible mainly as I don’t think he’s match fit. Del Bosque, put in Llorente or Cesc Fabregas behind Villa please. 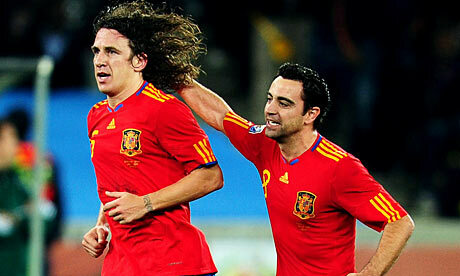 Spain should win this easily but they’ve yet to show anything like they can produce (except David Villa). Paraguay have a certain gritty determination about them, and I think they’ll give it everything but fall short. So that’s it. 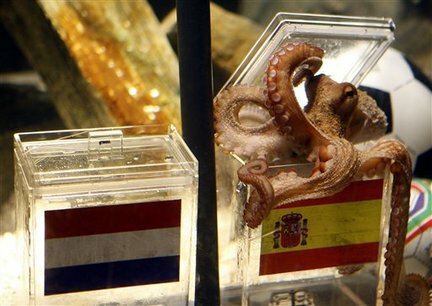 Let’s hope my record of prediction continues to be better than Mark Lawrenson and level with Paul the Octopus.